Two months from now, voters across North Carolina will go to the polls and cast their ballots. Thanks to two key court rulings Tuesday, long delayed ballots can now be printed. Several cases in litigation over balloting and redistricting issues had cast a pall over the state’s scheduled elections, causing considerable confusion amidst a backdrop of political rhetoric and high stakes posturing. But now, all six controversial NC constitutional amendments are scheduled to be on the Nov. 6thballots referendums. Both the NCNAACP and Gov. Roy Cooper sued the legislature over two proposed constitutional amendments they alleged were written deceitfully to fool voters as to their true intent. The amendments essentially took the power of appointment to boards and commissions, and filling judicial vacancies away from the governor, giving those powers to the legislature. A three-judge panel ruled in Cooper and the NCNAACP’s favor at first, but Republican legislative leaders called lawmakers back into yet another special session last week, rewriting the original two amendments in question. Cooper challenged the rewritten referendums claiming that they are just as misleading as the originals, but the same three-judge panel denied his argument. The governor appealed straight to the state Supreme Court. A three-judge panel denied the NCNAACP lawsuit to stop two other proposed constitutional amendments – one that would ask voters’ support for a new voter ID law; another capping the state income tax just over seven percent. The state’s High Court on Tuesday declined to take up the NCNAACP’s suit per the two proposed amendments restricting gubernatorial powers, and then ruled against Gov. Cooper’s appeal. So those four amendments will be on the ballot Nov. 6th, along with two that were not challenged in court. Meanwhile, all parties in the combined cases of NC League of Women Voters versus Rucho, and Common Cause of North Carolina versus Rucho agree that there wasn’t enough time before the November elections to redraw all thirteen Congressional districts that now have been ruled unconstitutional due to partisan gerrymandering. A three-judge federal panel had offered the option of holding primaries in November under newly drawn maps, with elections taking place in January 2019, right before the new Congress is seated, but both plaintiffs and defendants filed briefs last week nixing that idea, saying that it would cause too much disruption and confusion this close to Election Day. At press time Tuesday, that same three-judge federal panel agreed. The current congressional districts, as drawn in 2016, cannot be used past the 2018 elections, the court maintained. Fresh from his much-applauded eulogy at singer Aretha Franklin’s funeral tribute in Detroit last Friday, North Carolina’s Rev. Dr. William Barber, president of Repairers of the Breach, and co-chairman of “the Poor People’s Campaign: A National Call for a Moral Revival,” is now slated to further build his growing national profile by keynoting the Congressional Black Caucus Foundation, Inc. (CBCF) 48thAnnual Legislative Conference Phoenix Awards Dinner on Saturday, Sept. 15that the Walter E. Washington Convention Center in Washington, D.C.
That special occasion, the culmination of a five-day conference - from Sept. 12 – 16th- of issue forums, professional development seminars, exhibits and national town halls for policymakers and emerging leaders, became popular in recent years when both President Barack Obama, and First Lady Michelle Obama keynoted. It was 1970 when black members of Congress held their first Annual Legislative Conference. A year later, the Congressional Black Caucus was established by 13 members in the 92ndCongress. In 1976, the CBC Foundation was established as a nonprofit, nonpartisan public policy research and educational institute. CBCF later began a scholarship fund for deserving college students. 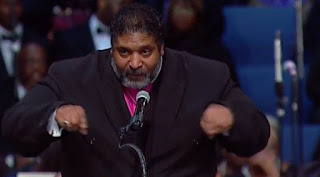 Dr. Barber, the immediate former president of the NC NAACP, has been in the national spotlight ever since he led the massive “Moral Monday” demonstrations for several years , challenging what he called the “repressive” policies of the Republican-led NC General Assembly against the poor and people of color. Nearly 1,000 protesters were arrested during the first demonstration, spawning similar demonstrations across the country. In 2016, Dr. Barber addressed the Democratic National Convention in support of Hillary Clinton’s presidential campaign, which is where Aretha Franklin saw him, contacted barber, and invited him to come preach at a community service for her church. The two maintained a long distance friendship until the “Queen of Soul” died a few weeks ago. Dr. Barber was one of the many religious and celebrity luminaries invited to speak in tribute at the large public eight -hour funeral for Ms. Franklin held in Detroit last week, along with other North Carolina notables Pastor Shirley Caesar of Durham, and singer Fantasia Barrino of Winston-Salem. The event was televised across the country and around the world. When Dr. Barber returned to his home church of Greenleaf Christian in Goldsboro last Sunday. He quipped that his congregation should never again complain about how long their churches are, given how long the Aretha Franklin star-studded funeral service ran. [CARRBORO] In the wake of the controversy over the dethroning of the silent Sam statue at UNC-Chapel Hill, some residents next door in the town of Carrboro are petitioning to have that moniker dethroned too. The town is named after Julian Carr, the white supremacist who originally dedicated the Silent Sam statue in 1903, boasting that it was symbol of the white South. The Carrboro Board of Aldermen decided against changing the name, citing the costs and complications associated, but did agree to a “Truth Plaque,” acknowledging Carr’s racist history, but also committing the town to the spirit and work of social justice. The local NAACP will play a role in writing that plaque. Meanwhile UNC – Chapel Hill Chancellor Carol Holt said last week that she would like to see the Silent Sam statue relocated elsewhere on campus. The UNC Board of Trustees have given Folt and the UNC-Chapel Hill board until November to decide what to do with the fallen statue. [HILLBOROUGH] In reaction to the Nike Show company’s new “Just do it” ad campaign featuring controversial ex-NFL quarterback Colin Kaepernick – the first to take a knee during the National Anthem in protest to police brutality - sports fans across the nation are defiantly burning and destroying their Nike shoes, socks, etc. in protest. But the Hillsborough Police Dept. is asking that instead of destroying Mike shoes, why not just donate them top a worthy cause for someone else to wear. Kaepernick is currently a free agent who hasn’t played pro ball since 2016. He is currently suing the NFL. [FAYETTEVILLE] Tyrone Antoine Williams, who was forced to resign from the Fayetteville City Council in May under allegations of corruption, has now been charged with taking indecent liberties with minor. Williams was arrested and charged Tuesday, He was released on $100,000 unsecured bond and released. The incident allegedly occurred last December when Williams was still serving on the council. Police say he did know the victim.